There has been much discussion of Brexit and what it will mean for Ireland, for businesses here, for different sectors, and for social and cultural interactions. The discussion is, of course, taking place in the context of multiple unknowns. We don’t know if there will be a hard or soft Brexit, how the movement of people will be affected, what charges might be levied on goods crossing the border, or the kinds of goods which could be affected. Thus nothing can be said definitively about Brexit and how it will impact on the region and communities most affected by the border. However, despite the lack of information and lack of certainty, it is still important to consider possible implications and to look at data that could give us a better understanding of what might occur and what policy might be needed to mitigate or address the issues that could arise from Brexit. The issue of Brexit and some of the potential regional issues were discussed at the Association of Irish Local Government www.ailg.ie/ seminar in Sligo on 12 October and a full presentation made to the elected members of local government at the seminar is available here to publication uploaded. It provides more detail on some of the issues discussed but, as with all Brexit discussion, it is speculative and because the potential implications of Brexit are so wide ranging it is inevitably only a partial discussion of some possible aspects. Day to day social interactions. The focus of this post is largely on some of the data available on commuting and other cross border interactions, but some other less discussed issues are mentioned briefly and some of the areas where more information would be of benefit are outlined. For the most part in this post ‘cross border’ refers to interactions between Northern Ireland (NI) and the Republic of Ireland (ROI). The border between the Republic and Northern Ireland is twisty and long though enclosing a relatively small area and, in recent decades, it has been virtually invisible with crossings being made on all roads of all kinds from national primary routes to tiny lanes and tracks. It is over 480 km and has about 275 border crossings (the exact number depends on how many small lanes are included in the count). This compares to the 6,000km long border to the East of the EU which has only 137 border crossings. Indeed there are 11 crossings on an 850 km border between Poland and Ukraine, and only 13 official border crossings between Finland and Russia (1,340 km). Thus implementation of any border and customs checks on the island of Ireland will be complex. Looking at the common travel area and the number of interactions really highlights the challenges and implications of whatever is the final Brexit agreement. Annually there are about 110 million border crossings made by people between Ireland and Northern Ireland, with most of these by private vehicle. There are about 0.9m crossings by rail. On the 15 principal crossing points where the numbers crossing are recorded, there are 43 million recorded vehicle crossings annually, and of course, as noted above there are many (about 260) other crossings. Indeed the road network means than people travelling from place to place in the ROI, or place to place in NI may make multiple crossing in the course of their journey. Between Ireland and Great Britain there are annually about 15.4 million crossings of which 12.7 million are made by air and 2.7 million made by ferry. The main reason for these is to visit friends and family, with holidays and then business trips next most important. There is a very significant level of commuting, largely for work but also for education, occurring across the border. This is illustrated in the map (Fig. 1) below which is derived for the CSO Census of Population 2016. 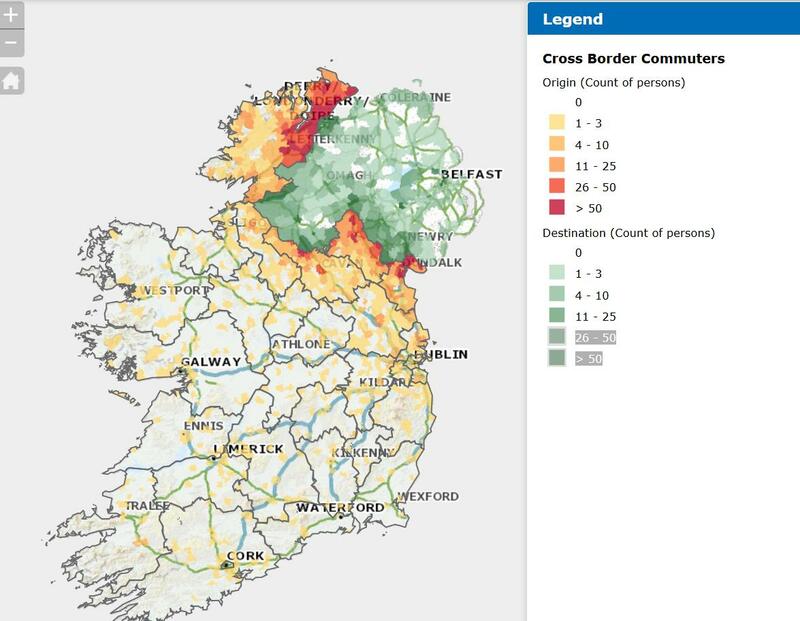 Parts of Donegal show very high levels of commuting and indeed along the border it is a common practice, but it extends further into the rest of Ireland too. It should be noted this is people commuting from ROI into NI. The 2011 Census for Northern Ireland estimates that 14,800 people commute cross border for work and study (footnote 1). Table 1 provides information about the main origin and destinations of cross border commuters. Those commuting from Donegal to Derry account for 46% of the commuting and Donegal commuters into NI are more than half (60%) of those commuting into NI. In addition to the significant cross border commuting for employment into NI a total of 3,531 people stated on the 2016 Census form that their place of work was outside the island of Ireland. The most popular overseas working destination was Great Britain; 2,144 commuted to England, Scotland and Wales. Table 1 above includes people commuting for both work and education, and while the numbers commuting to school and college are relatively small, they are significant in certain communities. These are children whose education could be affected by changes arising from Brexit. Some 693 primary school pupils (aged 5-12) are travelling into NI each day for school and 707 secondary school pupils (aged 13-18). Finally there are 899 students commuting daily to school and college (over 19 years). This figure does not include those from the ROI who live in NI while studying at third level. There are clearly some potential implications for those who are commuting across the border which depend, of course, on the type of border and the checks which might be put in place at crossings. The time taken to commute may increase to take account of border changes; an element of unpredictability as to how on the trips will take could be introduced; and there could be potential delays at border crossings and difficulties for those connecting between parts of Ireland (Donegal to Dublin for example) with visas to work in ROI and are travelling across NI. Already with the currency impacts of the Brexit decisions there are implications for the take home pay in local currency which can in turn influence where people spend their wages and salaries and do their shopping. The discussion above has highlighted some of the cross border interactions for employment and education which are currently happening but there are of course other cross border interactions which will be affected. There are many businesses with cross border supply chains, some of which can be very complex involving raw materials and product crossing the border a number of times at different stages of the production process. Manufacturers and dairy processors could be particularly affected by this, but unfortunately there is limited data available at present on the full supply chain implication of various Brexit options. There is likely to be a significant effect on those companies which have supply chains which have developed across the border and for the people working in those enterprises who may also be among the cross border commuters discussed above. There is also the issue of cross border infrastructure and how Brexit might affect investment and development of critical infrastructure in the Region and in the North West in particular. This is a huge area which is only touched on very briefly here. Changes arising from Brexit will have implications for road investment. There are national routes (A routes in NI, N routes in ROI) which require significant investment and which have very important implications for connectivity and accessibility in the region across the border and connecting Donegal to the rest of the ROI. It is not clear if cross border investment in infrastructure (e.g. ROI funding for development of roads in NI which benefit connectivity) will take place or if the investment focus could be on road improvements which circuit the border. Similarly roads which are used mainly by local communities in the course of day to day business could be affected. Local authorities will decide what investment to make in these roads but will need information on how their usage might change. Rail and bus traffic could be affected by border posts and customs, and again it is not clear whether the same level of passenger numbers will remain. Ports and Ferries in the ROI may have the opportunity to respond to new demand, either for direct services to France or to take some of the traffic currently going through Larne from the ROI. Finally there are very significant implications for energy (both electricity and natural gas), with potential changes to the energy markets and their governance, and the possible changes in the implementation of regulations and agreements all having potential consequences. There are currently a variety of services provided across border organised by agreement among government and service providers which could also be affected. There does not appear to be a definitive list of these services but they include the provision of cancer treatment and radiology services in Derry to people in the North West (Donegal especially), the provision of all island children’s cardiac care in Dublin and other local hospital services including renal, ENT and urology services. People can have prescriptions filled on either side of the border too. In a separate area there is also agreement about the provision of some library services. We need to be better information available about the suite of services that are available across the border which people are using now but which might be affected in future by Brexit. Clearly there are many areas where we have a limited understanding of potential issues which could arise from Brexit or where we lack information which would help inform our decisions. We have a weak appreciation of the reasons people are travelling across the Border; how often they travel; and whether it is for work, trade or social reasons. Similarly, we don’t have good information about local businesses supply chains and trading patterns; local service provision; the kind of community engagement ongoing and local social and cultural activities taking places across the Border. In order to make the best decisions and the have the best policy responses to Brexit, better understanding of the issues and better information about the current situation is essential. This entry was posted in Economic Sectors, Economy, Employment, Infrastructure, Local Government, Regional Development, Roads, Rural Development and tagged Brexit, employment, Enterprise, IDA, Infrastructure, Regional policy, Rural. Bookmark the permalink.